← My Advice? Be a Good Painted Lady. Shirt Happens. Or It Doesn’t. Sometimes, you just have to step out of the way and let brilliance run its course. “I came across this gem while I was in Teacher’s College. It was posted on a bulletin board in a kindergarten class. The teacher was very sweet and innocent (just the type you’d expect to teach kindies), and I knew she hadn’t fully read what the card said. Her example had said, “Thanks for the shirt,” with a drawing of a shirt. So maybe that explains the simple mistake, but it doesn’t really explain the picture of the flowers. You can read more of Amanda’s humorous anecdotes at her new site. Click here to check it out. Posted on May 25, 2011, in Thank You Notes and tagged Amanda Bast, Chase McFadden, funny, Humor, Ironic Mom, kid writing, Kids, Leanne Shirtliffe, Some Species Eat Their Young, Stuffkidswrite.com, Thank yous. Bookmark the permalink. 53 Comments. This is brilliant…leaving out that one small letter changes the meaning a lot! I used to draw flowers when I was a kid because I couldn’t draw, and flowers were the only semi-identifiable thing I could reproduce! 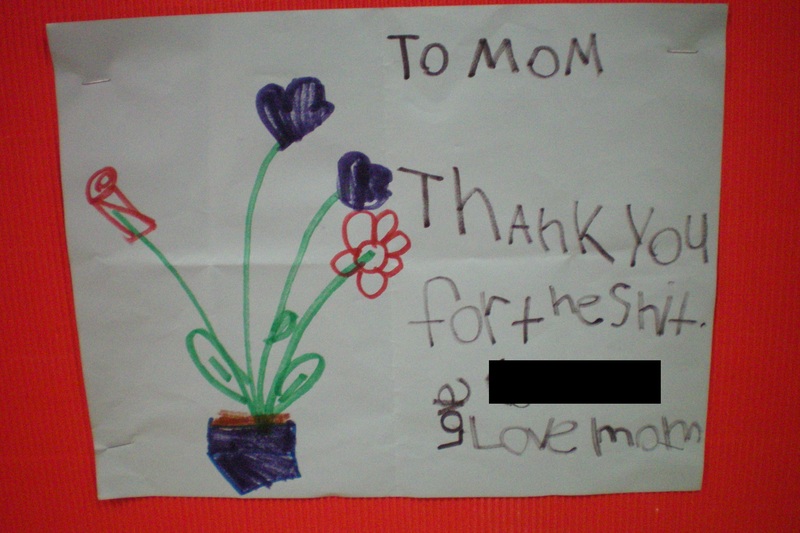 Also, the thank you note was for his mom…flowers for your mom are nice! Not sure how Amanda reacted when she saw it (besides immediately taking a picture), but I would have lost it. I believe there was a moment of silence. Shock and awe at the gloriousness that I was witnessing. Truly one of the most magical moments of my teaching career. This is so awesome I am tempted to give my kids nothing but shirts as gifts from now on. Then I can cross my fingers as they write me potentially hilarious thank you cards. Unfortunately, I just remembered I don’t make them write me thank you cards. Maybe give them a crape, too. Wait, crepe. Not as funny. If it said, “P.S. – Thanks for the shirt, too,” that’d be a nice touch. Ah, thanks for posting this. I’m so glad more people get to appreciate this find. Okay this is HILARIOUS!! I am a music teacher and teach little kids – so I can fully appreciate it! Thanks for sharing! Teachers are a gold mine for this stuff. Thanks, Cindy. This reminds me of a book my dad received one year: “Dear Teacher” – actual letters from parents to teachers in which typos and spelling errors rendered the original intent unimportant, as laughter ensued. I’d love to read that book. I’m suddenly lamenting the fact that my son is such a great spellier. I especially love that this was prominently displayed on a bulletin board. Classic! I wonder how many other people noticed it? Maybe the shirt had flowers on it? And those flowers had just been fertilized … with manure?? That is the most logical explanation I’ve ever heard. Well done. I’m going to go prowl the kindergarten / first grade wing of my kids school to see if any beauties pop up. certainly like what you’re stating and the way in which you say it. You make it enjoyable and you still care for to keep it wise. I cant wait to read much more from you. This is actually a wonderful website.